UNIT REACHES APPROX. 11' - LOADING HEIGHT = APPROX. 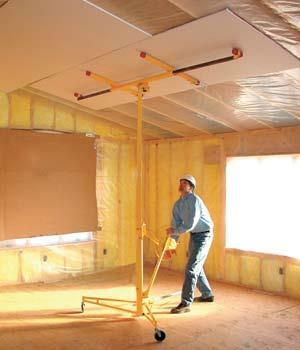 36"
SUPPORTS ARE ADJUSTABLE TO ACCOMODATE 8 FT OR 12 FT SHEETS. * Please call us with any questions about our drywall lift 11 feet rentals in Old Town ME, Milford, Bangor, Pea Cove, Eddington, Bradley, Orono, Bangor ME.